In this role, you are the one who makes sure people on campus are excited about the USC and everything we have to offer. Throughout the term, you will hire and manage a team of student volunteers to carry out of the goals of the USC and promote the services and events available on campus. You will also build up awareness of any USC initiatives alongside the Promotions Team by creating a consistent promotional campaign message. In this role, your will become social media savvy. Throughout the term, you will grow your digital skills, creating graphics and animations for various social media and web campaigns. You’ll also have a chance to work on the administrative end of things, attending meetings to discuss and brainstorm timelines for promotional campaigns. In this role, you will learn how to become a natural artist behind the lens. Throughout the term, you will capture the USC’s most exciting and important moments with crisp videos or striking snapshots to preserve these events for years to come. You’ll learn the ins and outs of becoming a professional photographer and videographer, dealing with everything from scheduling to editing. In this role, you will become an interpersonal skills wizard and promote the USC’s events and initiatives to all students on campus. Throughout the term, you will work with the USC’s administration to find effective marketing strategies and communication methods to make each USC campaign a success. You will also have the opportunity to prepare detailed reports of marketing trends based on research gathered by various departments. In this role, you will be the USC’s first resource for discovering student concerns, wants, and needs. 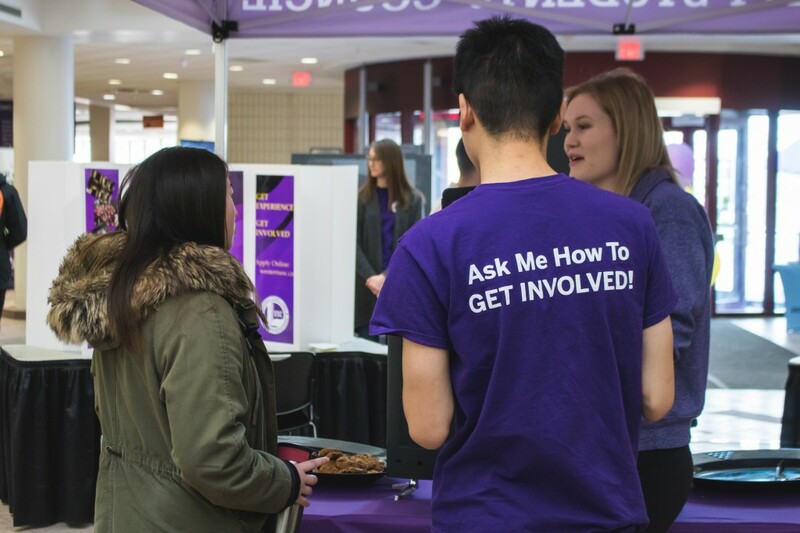 Throughout the term, you will have the opportunity to actively engage with the Western student body and record their thoughts on various aspects of their student experience. After you present the information to Advocacy Portfolio, you will be able to follow up and directly ensure that the students’ interests and needs become a reality on campus. In this role, you will help students discover their true passions and connect them with opportunities on campus or in the community where they can volunteer their time. Throughout the term, you will work with the Volunteer Services Coordinator to oversee the entire process, from selection, to training, and finally to recognition programs and awards. You will assist with volunteer training and preparation and play a big role in promoting the various volunteer and leadership opportunities available to students on campus. In this role, you will learn about every facet of the inner world of HR. Throughout the term, you will gain a holistic understanding of everything from the process of hiring a new employee, to training new staff, to managing health and safety presentations. You’ll grow your leadership skills and become one heck of an organizer while working in this department at the core of the USC. In this role, you will have the ability to let your inner creativity shine. Throughout the term, you will hone your technological skill set, perfecting your Photoshop, InDesign, and Illustrator abilities. You will create various eye-catching images and graphics for print and web campaigns that are instrumental in promoting USC initiatives and events on campus. In this role, you will engineer multiple facets of the USC’s technological resources. Throughout the term, you will have the opportunity to work in various departments such as Web Design and IT (Information Technology) to identify areas for improvement and possible solutions.You will also play a role in the USC’s product development, assisting in the creation of new infrastructure services and prototypes and working to bring them to life. In this role, you will perfect your scheduling and project management skills while ensuring that cycling remains an accessible resource for students on campus. Throughout the term, you will facilitate educational events on how to fix up your bike and ensure the daily operation of Purple Bikes runs smoothly. You’ll work to promote Purple Bikes’ initiatives to students and encourage the environmentally friendly culture of cycling on campus. Find out how the USC is governed. These students assist the Executive. Students who run our services and events. Get paid to help with research and other duties. Contribute content to our social media. Help promote our events and services. Get involved in the London community.